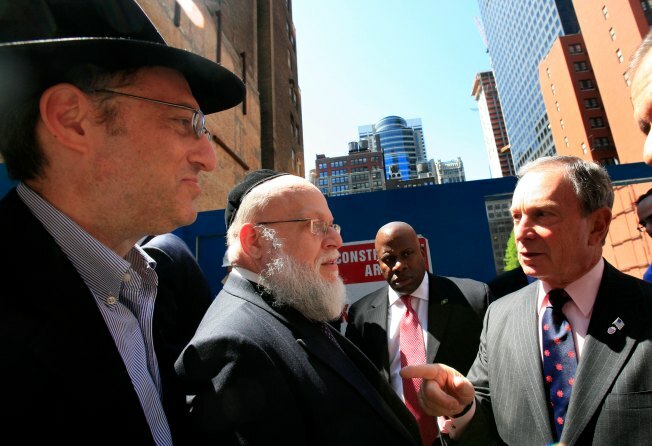 Mayor Michael Bloomberg, right, talks with diamond dealers Moshe Halpert, left, and Jacob Banda, second left, at a groundbreaking ceremony for the International Gem Tower on Tuesday. Construction has begun on a 34-story International Gem Tower that will house hundreds of businesses in the heart of New York City's Diamond District. City officials announced the groundbreaking for the tower Tuesday, which will feature a facade of diamond-shaped steel medallions. "New York City's Diamond District is one of the greatest shopping centers in the world, and investments like the International Gem Tower will enhance it and help create a modern and dynamic hub of economic activity," Deputy Mayor Robert Lieber said today. Added Mayor Bloomberg: "The wholesalers, retailers, manufacturers and designers that make up New York City’s jewelry industry are a valuable part of the local economy." The building will have space for 250 gem and jewelry retailers, manufacturers and designers when it opens in 2011. The Extell Development Co. project will cost about $750 million. City and state officials guaranteed nearly $50 million in tax breaks if the developer can recruit enough new businesses.